This Berlin Gardens Round Poly End Table is the perfect accent table for your outdoor living room. The 22" round diameter top allows for plenty of space to place your beverages or reading material. With three heights available and an array of beautiful poly colors, you're sure to find the perfect end table to fit your decor! Made of recycled plastics, the Amish Poly Round End Table is the eco-friendly, maintenance-free choice in outdoor furniture and made to last generations, even when continuously faced with the elements. 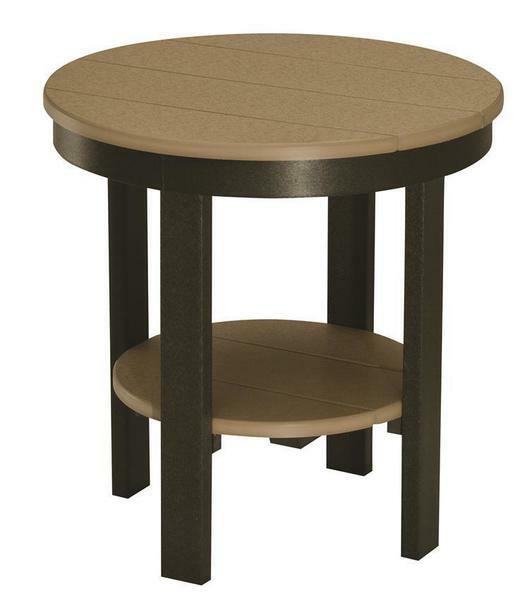 Total Width - 21 1/2"
Bottom Shelf Width - 15"
Leg Height - 26 3/8"
Total Height - 32 1/2"
Leg Height - 29 3/4"
Click here to view assembly instructions for this end table. The awesomeness that is my new patio furniture arrived today - it looks outstanding! Please send my thanks to Ashley for helping with the color selection and swatches.